Newly appointed U.S. Ambassador to Thailand H.E. 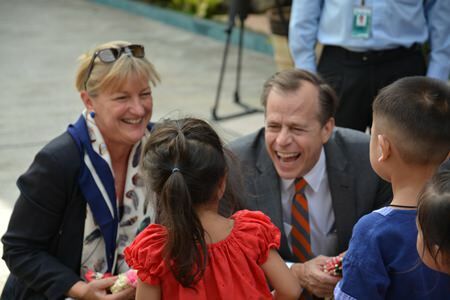 Glyn T. Davies toured Laem Chabang Port and visited the children of the Father Ray Foundation during his first visit to the Eastern Seaboard. The Dec. 2 trip began at Laem Chabang’s Customs Bureau. 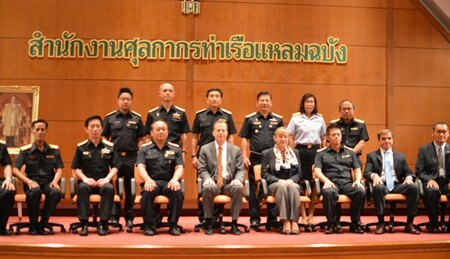 He was accompanied by his wife, Jacqueline, and welcomed by the Customs Bureau Director Samphan Jarurattananont, Cargo Inspection Techniques expert Chakrit Utensute, and other officers. 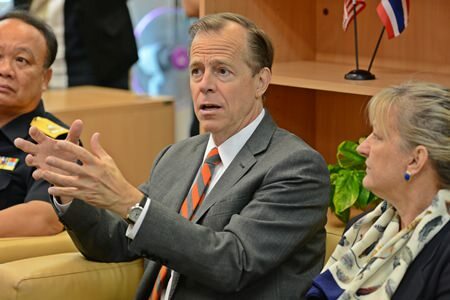 Davies said the U.S. government is very proud to be a partner of Thailand. U.S. 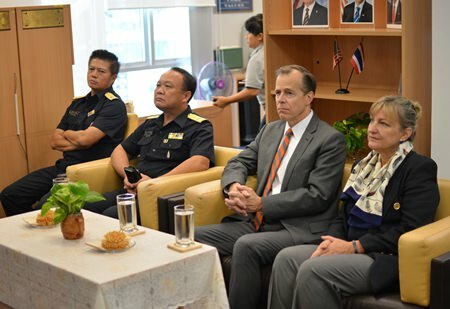 Ambassador to Thailand, Glyn T Davies (left) presents CT-30 equipment to Samphan Jarurattananont (right), the director of Laem Chabang Port Customs Bureau during the American diplomat’s official visit. “I have a very high interest in the mega-port and the Container Security Initiative and I would like to say on behalf of my government, and all the American people, how much we admire what you have done here in two ways. 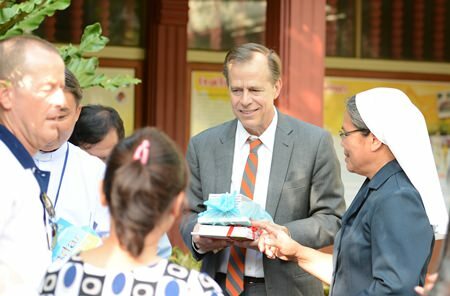 He added that Thailand and the United States have many things in common and spoke of the high regard that the U.S. holds for Thailand and the deep relationship between the countries for nearly two centuries, collaborating on a wide range of issues. He specifically highlighted joint efforts to advance regional security, trade and investment, enhancing public health, while assisting refugees and displaced persons. 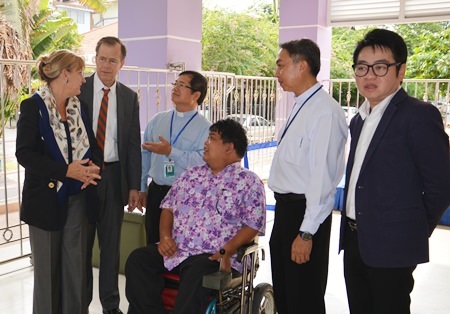 Chakrit told the ambassador that Laem Chabang Port Customs Bureau operates under the CSI since it was launched in 2002 by the U.S. Bureau of Customs and Border Protection, an agency of the Department of Homeland Security. Its purpose was to increase security for container cargo shipped to the U.S. In appreciation, Ambassador Davies presented the customs bureau with new, high-tech inspection equipment and posed for a group photo. 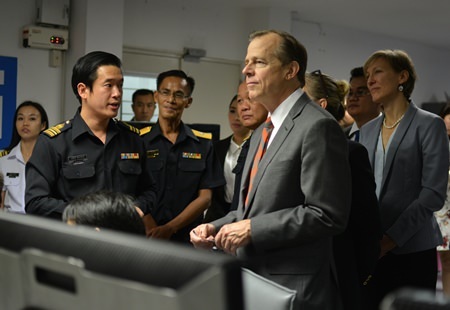 Ambassador Davies and the delegation later moved on to the Central Alarm Station where he was shown all CCTV monitoring rooms and was briefed on the operations. 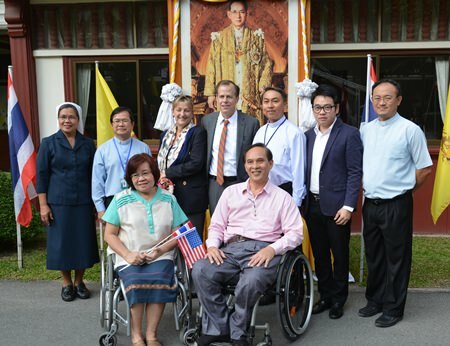 Ambassador Davies was welcomed by the disabled children of Father Ray Foundation in Pattaya. The last stop was to the CBP CSI office where a video was shown outlining security policies and initiatives. Before heading to Pattaya, His Excellency spared time to engage the press and talked about his experiences in Thailand. 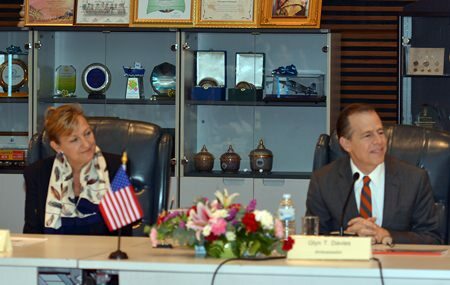 An interview took place between the U.S. ambassador and Sue Kukarja, Pattaya Mail’s Director of Communications. 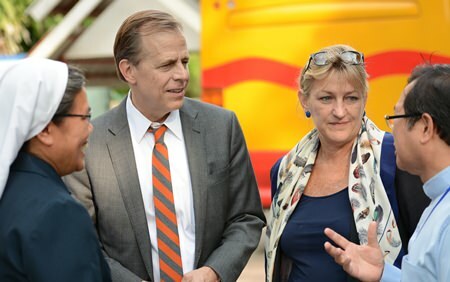 On the objectives regarding this visit to Chonburi, H.E Davies said: “We’ve actually been planning to come down to Chonburi for some time now and I’ve only been here for just over seven weeks. I wanted very much to come down and see this mega-port and its massive facilities. “We have cooperated with Thailand for many years under several initiatives. 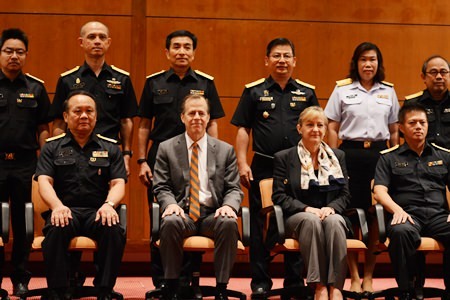 One of them is the security policy for containers and cargo in which Thai authorities and customs have been working together quite impressively to try to enhance capabilities here to protect and stop contraband and drugs and other objects. This includes weapons that are violating laws, drugs or anything that poses a risk to Thailand or in terms of export to the United States. 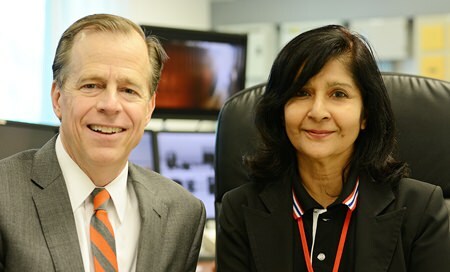 “We have radiation devices that we use to secure Thailand and its people from danger. (Bombs) can now be found and stopped. It is important for global trade as Thailand trades with many other countries and it is strictly important to have this collaboration. Asked about his challenges in Thailand so far, H.E. Davies said: “It’s a big country and the challenge for me is learning. I still feel as if I’m in school and I have yet to call out all on the ministries of the government, and there are many of them, but I have many more to go. 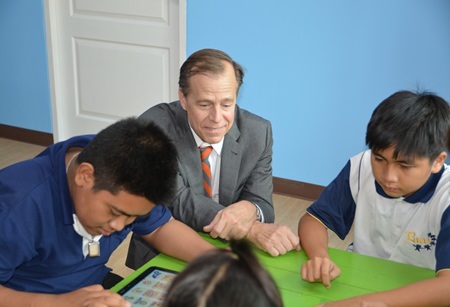 I plan to talk to people in other parts of Thailand so that I can understand what’s on their minds because this is part of my job as an ambassador, to represent the United States to the government and the people of Thailand and to understand where they are coming from and what they are thinking. I am working very hard to understand, even if just a little at a time to learn about Thailand so that I can do a better job. Sue Kukarja, Pattaya Mail’s Director of Communications (right) had a one on one interview with the Ambassador during his recent visit. Ms. Kukarja concluded the interview by asking the ambassador about the goals and targets he has set for himself during his time in Thailand. H.E. 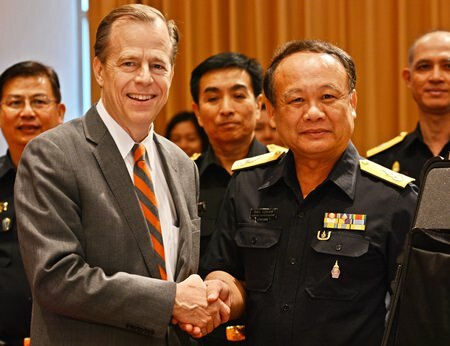 Davies replied: “Well, I think I’ll know better over time for a precise answer to that, but first all is learning so that I can understand and reinforce the relationship in the many ways that the U.S. and Thailand can work together and concentrate our energy on. There are so many in regards of the security relationship, our massive and important health relationship for doctors of Thailand to work together with doctors in the United States and the relationship between the younger leaders of Thailand and the US. “There are so many aspects to be attended. My wife and I are parents to two daughters and grandparents of two granddaughters. 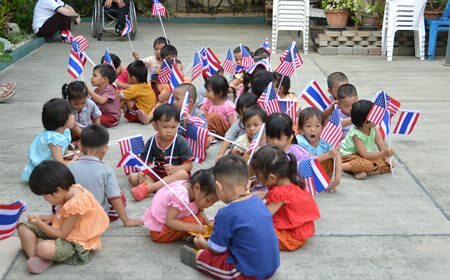 So the important fact in my mind is finding ways for new generations of Thais and Americans to understand the importance of this relationship as it goes all the way back three centuries ago. The relationship and foundation was built by the previous generation and the question is how do we reinforce it, establish it and strengthen it. 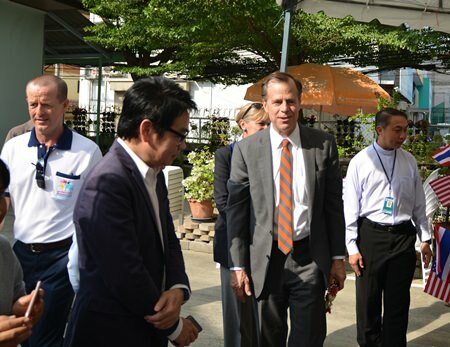 This is so that Thailand and the U.S. can remain strong allies and partners in the future for mutual benefits. 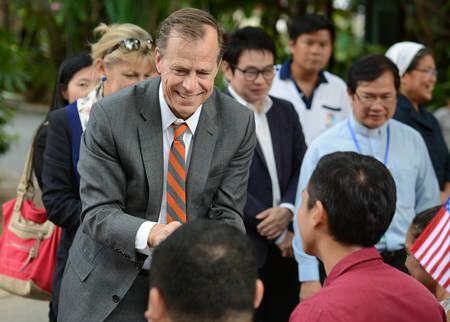 After the visit to the port, the ambassador’s entourage headed off to the Hilton Pattaya Hotel for lunch and to meet with hoteliers before continuing on to the Father Ray Foundation. President Rev. Peter Pattarapong Srivorakul and Vice President Rev. Michael Picharn Jaiseri welcomed Davies and disabled children presented flowers and gifts. The ambassador and his wife enjoyed their time with the children who ranged from being wheelchair-bound to those able to play sports. There also were blind students with whom they played games. A brief presentation showed the objectives and accomplishments of the Father Ray Foundation. Derek Franklin of Fr. Ray Foundation said new sponsors have enabled the foundation to build more facilities. A tour around the facilities included the bakery and museum. H.E. Glyn T Davies was nominated as ambassador by U.S. President Barak Obama on April 14, confirmed by the Senate on Aug. 5 and sworn in on Sept. 14. He served as the Obama administration’s point man for the diplomatic response to North Korea’s nuclear program between 2012 and 2014. Prior to that, he was the U.S. representative to the International Atomic Energy Agency in Vienna.